Jordi Puntí is a writer, translator and a regular contributor to the Spanish & Catalan press. In 1998 he published his first book of short stories, Pell d’armadillo (Proa, 1998) which won the Critics’ Prize Serra d’Or. Puntí confirmed his literary standing with Animals tristos (Empúries, 2002), published in 18 languages and turned into a film twice. His first novel Maletes perdudes (Empúries, 2010) won several awards –including the National Critics Award and the Bookseller Award– and became a huge bestseller. The novel was followed by a collection of articles, Els castellans (L’Avenç, 2011). His latest published works are the collection of short-stories Això no és Amèrica (Empúries-Anagrama, September 2017) and a collection of articles around Leo Messi, the so called best football player in the world, entitled Messi: exercicis d´estil (Empúries-Anagrama, April 2018). 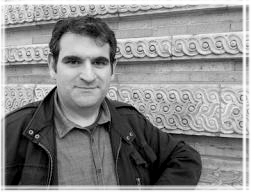 Jordi Puntí is one of the recipients of The Dorothy and Lewis B. Cullman Center for Scholars and Writers Fellowship 2014-2015 at the New York Public Library.